Location: Just off Route 302, across from the Raymond Shopping Center, and behind Jordan Bay Veterinary Hospital. A four mile drive from the Windham shopping area and a seven mile drive from Naples. Tassel Top Beach is situated on 35 acres on the east shore of Sebago Lake. A stand of mature pines and hardwoods grace the entrance to the park and the park road leads you to a graveled parking lot. 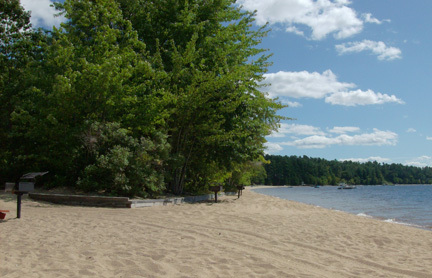 A short walk brings you to 900 feet of sandy beach, one of the best beach areas on Sebago Lake. The beach has a secured swimming area marked by buoys; however there is no lifeguard supervision. The beach area has many picnic tables, outdoor grills and changing rooms are also available. Tassel Top offers a fully stocked Snack Shack with ice cream, hot foods, charcoal, candy, drinks, snacks, clothing, sundries, beach toys and more. Another enjoyable feature of Tassel Top is a walking trail, covering about 0.90 of a mile, that meanders through acres of Maine woods. The clearly marked trail has points of interest marked by signage and benches for quiet meditation or rest. The trail is maintained by park staff and is handicapped and stroller accessible. This path if for FOOT TRAFFIC ONLY. No bikes, ATV's...etc. There is no boat launch at the park and boats of any type are not allowed on the beach. Dogs and other pets are not allowed in the park or on the beach at any time. The park is supervised by a Park Ranger and Assistant Rangers, who are present daily. Please check Facebook for current daily hours and infomation. A link to Facebook can be found on the bottom of this page. * No incoming traffic 1/2 hour prior to closing. Patrons must vacate park BEFORE closing time. NOTE: Park may open late and/or close early due to inclement weather or lack of business. Opening weekends from Saturday of Memorial weekend until full season opening. Open daily from June 1st through Labor Day.